Home Brand	Her Universe Promises Lots of Exciting Reveals at WonderCon! Her Universe Promises Lots of Exciting Reveals at WonderCon! NEW YORK, NY – March 10th, 2016 – Her Universe, the groundbreaking fangirl fashion company and lifestyle brand, today announced its return to WonderCon, the must-attend event being held at the Los Angeles Convention Center March 25th through the 27th, with exciting news and new products for fans of sci-fi fashion, publishing and more. This year, Her Universe is hosting two panels and a portfolio review at WonderCon that are not to be missed. For the last two years, Her Universe and Hot Topic have produced The Her Universe “Geek Couture” Fashion Show at San Diego Comic-Con. Two winners, each year, were chosen and given the unique professional opportunity to design a fashion collection with Her Universe to be sold in Hot Topic stores. To kick off the 2016 fashion show, fans and designers will be able to attend the “Her Universe Fashion Show Update” panel at WonderCon (Friday, March 25th, 2pm to 3pm in room 502B) where they will be the first to hear updated information on submitting their designs for this year’s show at SDCC and be the first to see the upcoming collection designed by last year’s winners, Leetal Platt and Kelly Cercone. Actress, Her Universe Founder and voice of Star Wars Rebels’ Ahsoka Tano, Ashley Eckstein, SVP of Her Universe, Cat Carson, Hot Topic VP of Merchandising, Ed Labay, and Hot Topic Director of Brand Marketing, Andrea Lewis, will also be on the panel to give advice on how fans can go from runway to retail. For fans and designers looking to submit their designs for The Her Universe Fashion Show or who just want to get into the business of geek fashion, they are invited to share their portfolio with industry professionals from Her Universe and Hot Topic and get tips and advice on how to best prepare their fashion portfolio at the “Her Universe Geek Fashion Portfolio Review” (Saturday, March 26th from 10:30am to 11:30am in room 150). Her Universe is also sponsoring a second panel for its publishing imprint, Her Universe Press. In the “Calling All Aspiring Writers/Her Universe Press” panel (Saturday, March 26th, 2pm to 3pm in room 515A) published authors and experts will reveal their advice to fans on preparing a winning pitch to get their novel published. Host Ashley Eckstein will be joined by the author of Weirdest, Heather Nuhfer, along with the author of The Confidence Chronicles, E. Anne Convery and New York Times, USA Today and #1 International bestselling author Christina Hobbs writing under the penname Christina Lauren with her writing partner. Ashley Eckstein also revealed that Her Universe will debut several new fashion designs and offer its most popular fangirl apparel from Star Wars, Marvel, Doctor Who, Star Trek and more in the Her Universe boutique (booth #1225). The boutique will feature an assortment of casual and dressy options for female fans to fashionably express their fandom and flaunt their world. Her Universe and Kohl’s will be premiering at the WonderCon Her Universe booth the first-ever Marvel activewear collection for juniors inspired by the upcoming, highly anticipated film, Marvel’s Captain America: Civil War. This new capsule collection will be sold in Kohl’s stores nationwide and on Kohls.com the end of March. Her Universe was launched in 2010 by actress and entrepreneur Ashley Eckstein and The Araca Group, a leading theatrical production and brand management company. Ashley and Araca created Her Universe to address the expanding market of female sci-fi and fantasy fans. They entered their first agreement with Lucas Licensing to develop and produce a line of female-centered Star Wars apparel and accessories. The success of that line was followed up with a collection for BBC Worldwide for Doctor Who, CBS Consumer Products for Star Trek, AMC for The Walking Dead, Nerdist Industries, Marvel, Hasbro for Transformers and Studio Ghibli. You can learn more about Her Universe and purchase the current line of fangirl apparel and accessories by going to www.heruniverse.com and by following Eckstein & Her Universe on Facebook (facebook.com/HerUniverse) Twitter (twitter.com/HerUniverse), Pinterest (https://www.pinterest.com/heruniverse/) and YouTube(https://www.youtube.com/user/HerUniverseChannel?sub_confirmation=1). 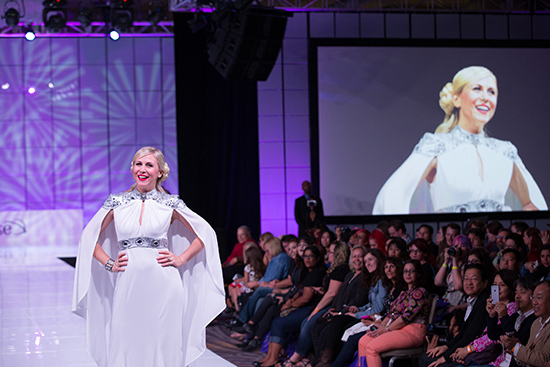 Her Universe Founder Ashley Eckstein on the runway from last year’s Her Universe Fashion Show. Fans will get the scoop on this year’s show at the WonderCon Her Universe Fashion Show panel. 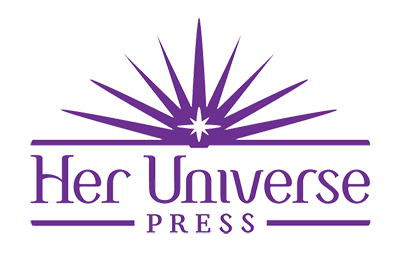 Published authors and experts will reveal their advice to fans on preparing a winning pitch to get their novel published at the Her Universe Press panel at WonderCon. 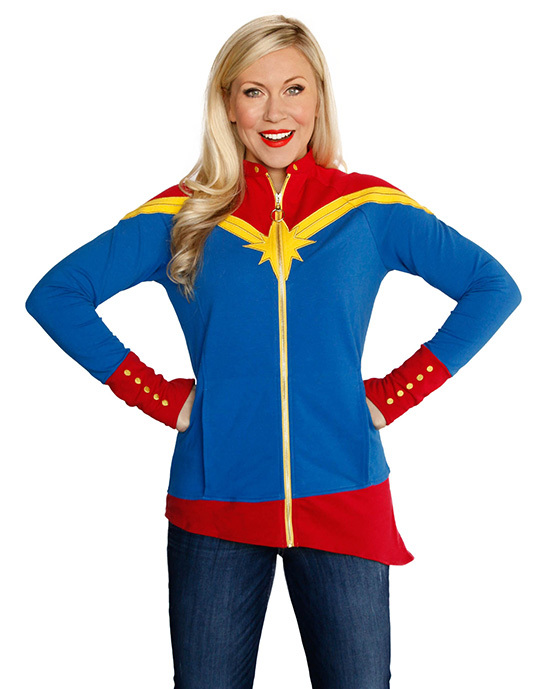 Her Universe will debut several new fashions at this year’s WonderCon including this Captain Marvel asymmetrical jacket designed to mirror her classic costume! 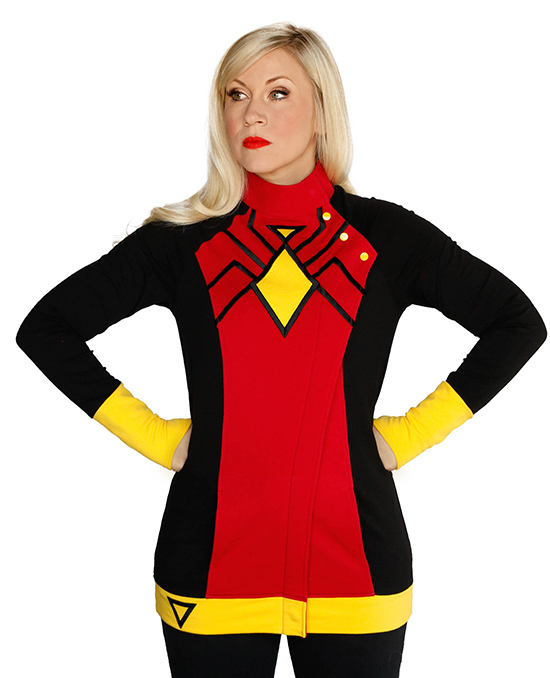 You can emulate the powerful heroine, Spider-Woman, in your daily fashion with this spectacular new raglan sleeve-style jacket available at WonderCon! Smuggler. Scoundrel. Hero. Han Solo, captain of the Millennium Falcon, was one of the great leaders of the Rebel Alliance and is now honored on this fashionable Jacquard cardigan available at WonderCon. 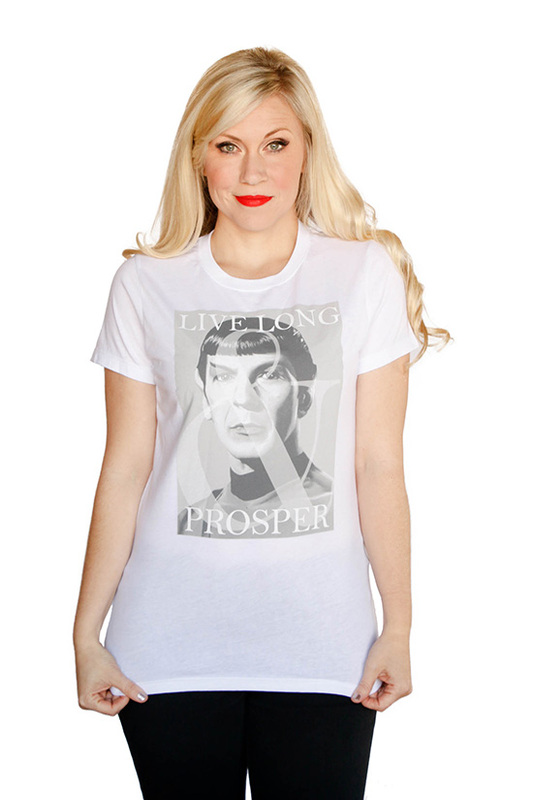 Gone but not forgotten, Spock will always Live Long and Prosper on this stylish Star Trek fashion top available at WonderCon. What does Star Wars mean to you? Fangirls Unite! Her Universe Panel at SDCC! How exciting! Wish I could be there to support! PS. These cardigans look so amazing! May the Force be with you, Her Universe! OMG, I have to have that Captain Marvel jacket!!! I really want that Captain Marvel Jacket! Great collection and efforts. Thanks.